Members of the St. Pius X CYO group attended a Catholic Heart Work Camp in Massachusetts from July 2 to July 8, 2017. The group was led by moderator Cindy Honyara (third from left, with infant). Summer is usually a time to get away and relax. But for one group of area youth, vacation time is a chance to serve others. 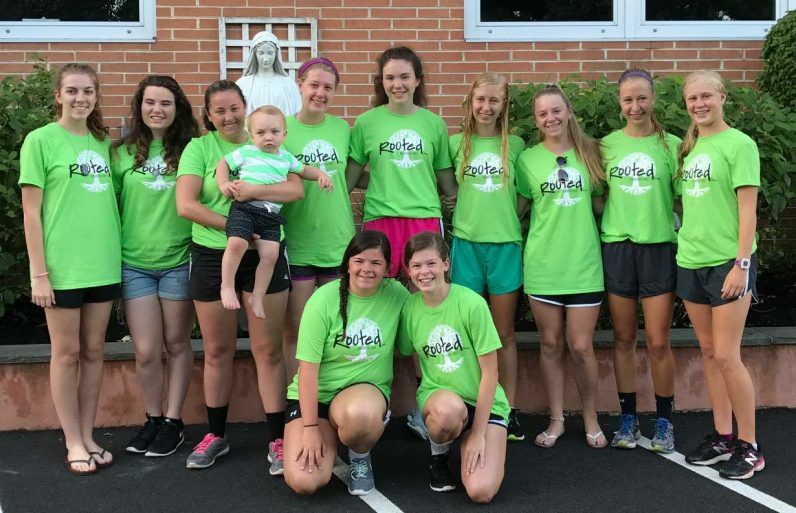 Almost 30 teens from St. Pius X Parish in Broomall and Pope John Paul II High School in Royersford trekked to Groton, Massachusetts from July 2 to 8 to work on a variety of service projects. Rising at 6:15 each morning, the group attended daily Mass then headed to nearby assisted living facilities, where projects included painting, yard work and clean-up. Some attendees were assigned to a vacation Bible school to help distribute food for the needy. The mission trip was sponsored by Catholic Heart Work Camp, a non-profit organization based in Orlando, Florida. Founded in 1993, the national outreach pairs Catholic youth groups with opportunities to assist children, the elderly, the disabled and the poor. The St. Pius X CYO group has participated in the work camps for the past 15 years. The students from Pope John Paul II High School – who were accompanied by new principal Father Brian Kean – were new to the annual mission trip. The hands-on projects were accompanied by spiritual reflection and discussion. In addition to attending daily Mass, students engaged in prayer before starting their tasks, and shared their insights as they labored. The lively, varied pace left little time for boredom. Among the projects that Kathryn Stringer, a senior at Archbishop Carroll High School, worked on was fixing up a dining room. That meant removing wallpaper, priming and painting both walls and ceiling. “We had our work laid out, and although I knew it would not be easy, we were all excited to get started,” she said. In the evenings, the teens enjoyed social and spiritual activities – singing praise songs, acting out skits, going to confession and praying the rosary. On the group’s last evening in Groton, the residents whom they had helped were invited to share their thoughts on the work camp. “I loved hearing all the residents speak because it makes me so happy to hear all the good we had done for them,” said Donohue. The teens are eager to spread the word about what has become a tradition of joyful service.